The endothelium is the lining of blood vessels of the circulatory system, with a fundamental role in vasodilation. Studies of endothelial dysfunction are widespread and include a number of areas of both clinical and pre-clinical research. Fundamental to such studies are the techniques of laser Doppler monitoring and imaging combined, for example, with pressure cuff challenges, iontophoresis and/ or skin heating to provide reproducible challenges. The most recent advance in the field of iontophoresis and laser Doppler has been the use of laser Doppler imaging (LDI) in place of monitoring (LDF). The advantage of imaging is that blood flow can be imaged and recorded over an area of interest rather than a single point measurement, thus results are both more reliable and show better reproducibility. It is difficult to make a definitive recommendation due to the wide scope of challenges used, coupled with the use of both monitoring and imaging, and the number of suitable imagers available. Systems can be offered to suit a range of budgets though and you are welcome to contact us to discuss further. 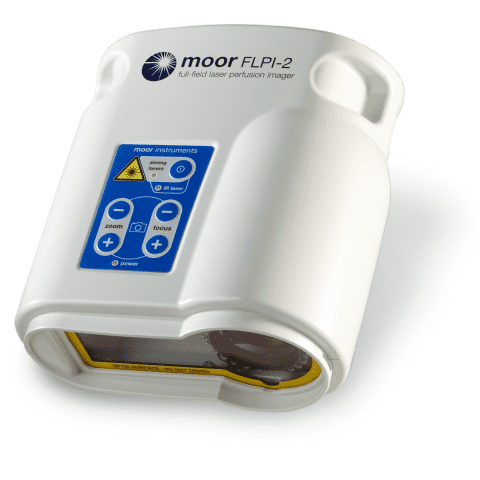 Extended use of equipment for other research fields might influence the final decision but an ideal investigation lab would include the speckle contrast imager (moorFLPI-2), iontophoresis (MIC2) and skin heating (moorVMS-HEAT) options. Comparative reproducibility of dermal microvascular blood flow changes in response to acetylcholine iontophoresis, hyperthermia and reactive hyperaemia. Microvascular responses following digital thermal hyperaemia and iontophoresis measured by laser Doppler imaging in idiopathic inflammatory myopathy. Reproducibility and repeatability of peripheral microvascular assessment using iontophoresis in conjunction with laser Doppler imaging. The association between serum urate levels and arterial stiffness/endothelial function in stroke survivors. A Methodological Approach to Non-invasive Assessments of Vascular Function and Morphology. Current concepts in assessment of microvascular endothelial function using laser Doppler imaging and iontophoresis.